TUSCALOOSA, Ala. – In a tight, hard-hitting struggle that lived up to the legacy of one of college football’s most storied rivalries, the 8th-ranked University of Alabama football team (7-1 overall; 4-1 in the Southeastern Conference) used a clutch touchdown drive by its offense and a staunch outing from its defense to overcome a late deficit in a 19-14 win over Tennessee (3-4 overall; 1-3 in the SEC) on Saturday afternoon before a capacity crowd of 101,821 at Bryant-Denny Stadium. After Tennessee tailback Jalen Hurd ran 12 yards for a touchdown with 5:49 left in the game, the Tide offense responded with a decisive 71-yard march to the end zone. 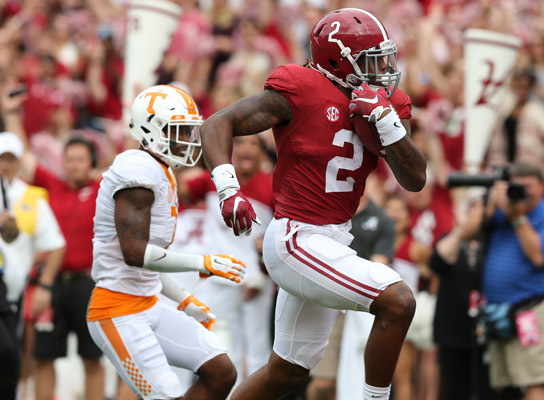 Tide quarterback Jake Coker completed key passes of 29 yards to wide receiver ArDarius Stewart and 15 yards to wide receiver Calvin Ridley on the drive that was punctuated by running back Derrick Henry’s tough running. Henry carried five times for 35 yards on the winning drive, including the game-winning 14-yard touchdown run with 2:24 left. Henry rushed for 143 yards and two touchdowns on the day while Stewart had six catches for 114 yards, and Coker passed for 247 yards while completing 21-of-27 passes. 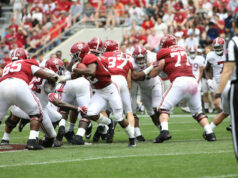 Linebacker Reggie Ragland led the Tide defense with a game-high 12 tackles (eight solos), including a tackle for loss. Punter J.K. Scott averaged 49.8 yards on four punts, including a 56-yarder. Alabama broke on top early on a 20-yard touchdown run by Henry with 7:14 left in the first quarter. The score marked the 13th consecutive game in which Henry has scored a rushing touchdown. Henry also moved past Shaud Williams (2002-03) into 13th on the Alabama career rushing list on the play with 2,306 yards at that moment. Tennessee struck back to tie it at 7-7 on an 11-yard pass from quarterback Joshua Dobbs to wide receiver Josh Smith with 3:00 left in the opening period. Tied 7-7 at halftime, Alabama moved back into the lead on the first possession of the second half by driving 73 yards in 12 plays to a 19-yard field goal by Adam Griffith for a 10-7 lead with 9:00 left in the third period. Three Tennessee scoring opportunities ended in missed field goals, a 43-yarder in the first quarter on the game’s first series, a 51-yarder on the final play of the first half, and another 51-yarder with 14:06 left in the fourth period. The first would have given the Vols a 3-0 lead, the second would have given UT a 10-7 halftime lead, and the third would have tied the game at 10-10 early in the fourth quarter. Taking the ball at the Tide 33 with 14:06 left in the fourth period, Alabama moved 56 yards in 12 plays while eating 6:58 of game time. A key sequence on the drive began with a third-and-11 play at the UT 46 with 10:19 left. Coker completed a 15-yard pass to Stewart for a first down at the UT 31. After a 10-yard penalty created a first-and-20 at the UT 41, a pass to receiver Calvin Ridley gained 26 yards to the UT 15. Ridley adjusted back to the pass after being covered on the play, grabbing the ball at the sideline and gaining several more yards after the catch. Henry gained five yards on a rush at right tackle to the Vol 10 on first down, then was dropped for a loss of a yard on second down. On third-and-six at the UT 11, Coker’s fade pass to receiver Richard Mullaney was incomplete in the end zone. That set up a 28-yard field goal attempt by Griffith with 7:13 on the clock. Griffith kicked it true to give the Tide a 13-7 lead with 7:08 left in the fourth period. Tennessee stormed back with authority to take a 14-13 lead, blazing 75 yards in four plays to take the lead on a 12-yard run by tailback Jalen Hurd with 5:49 on the clock. Dobbs connected with Smith for 27 yards on a crossing pattern to start the drive, reaching the Tide 48. 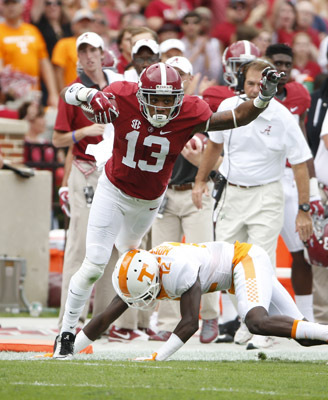 Two plays later, Dobbs hit a slant pass to receiver Josh Malone for 34 yards to the Tide 12. Hurd raced around left end into the end zone on the next play. Alabama responded on the ensuing possession. Facing second and 11 at the Tide 27, Coker completed a 27-yard pass to Stewart at the UT 44 with 4:29 left. Stewart made an acrobatic catch despite tight coverage. Henry gained two yards at left guard to the UT 42 on first down, then carried for two more to Vols 40. 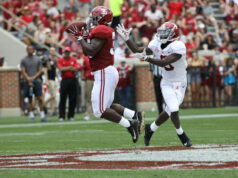 Facing third-and-six at the 40, Coker lobbed a pass to Ridley at the left sideline and Ridley made a leaping catch over a Tennessee defender for a 15-yard gain to the Tennessee 25. Henry gained six yards at right guard on first down to the UT 19. Tennessee called its first timeout with 3:02 left. On second-and four, Henry muscled up the middle for five yards to a first down at the UT 14. With the clock running under 2:30, Henry took a handoff at left end and ran behind good blocking for 14 yards and a touchdown with 2:24 left. 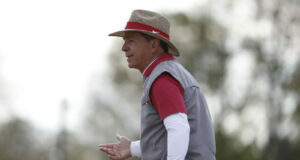 Leading by five points, Alabama went for a two-point conversion. A pass to Ridley was incomplete, broken up by Tennessee cornerback Justin Martin, and the Tide held a 19-14 lead with 2:24 left. Tennessee took possession at its 25 following a touchback on the kickoff. On the third play of the possession, Alabama defensive end Jonathan Allen sacked Dobbs for a nine-yard loss at the UT 26. Facing a second-and-24 at the UT 21 following a false start penalty, Dobbs was sacked by Tide linebacker Ryan Anderson for a loss of 10 at the UT 11. 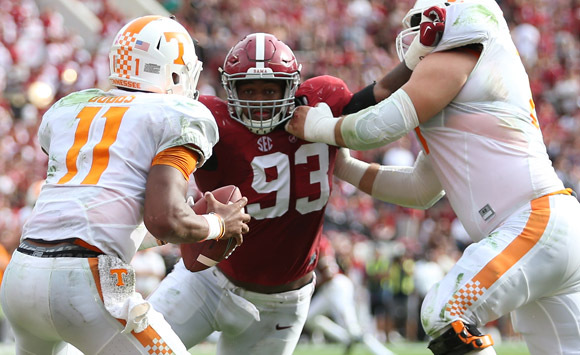 Dobbs fumbled on the play and Alabama’s A’Shawn Robinson recovered at the UT 13, before returning the ball nine yards to the UT 4 with 1:18 left. Coker took a knee on three consecutive snaps to end the game. Alabama will enjoy next weekend off from competition before resuming its season on Saturday, Nov. 7, at Bryant-Denny Stadium against the Louisiana State University. Kickoff time and television plans for the Alabama-LSU game were not finalized at the time of this report.